Patrick Osinski : startups advisor, all about Social Media, Marketing, Business Dev, SEO, Design, Digital content, Innovation, Apps. More about me: http://www.patrick-osinski.com "You know you're on the right track when you become uninterested in looking back." A rodeo cowboy gets eight seconds to become a champion. What can content marketers do with nearly twice that time? HubSpot reports it takes less than 15 seconds for a reader to decide whether or not content is worth the effort. Think about that : In half of the Jeopardy theme, your reader’s mind is already made up. You’re probably familiar with that statistic–it’s a marketing classic. But what exactly is happening in those 15 seconds? There’s a series of subconscious questions anyone asks as they’re contemplating reading content. You ask them; I ask them; and our fellow human beings that we call an “audience” ask them, too. 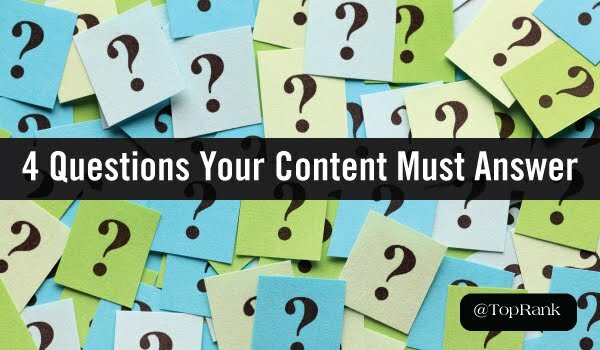 Your content must answer these four essential questions, and fast. #1: Are You Talking to Me? Marketers would phrase this question as “Am I the intended audience for this piece?” In the mind of a non-marketer, though, this question is full-on DeNiro in Taxi Driver. The hard part about addressing this question is that a “maybe” is the same as a “no.” If your reader can’t tell if they’re your intended audience straight away, they’re going to bounce like a ping-pong ball. So don’t play coy; call out your audience in the first few minutes. Cut everyone else loose. Make it clear exactly who should keep reading. Full disclosure: This post used to have 250 more words in the intro. I spent the first two paragraphs introducing a metaphor. Then I cut it to the bone, to start with a call-out to the audience. Are you a content marketer? Then yes, I’m talking to you. It’s important your readers get an equally clear message. #2: What’s in It for Me? It may seem strange to have to address this question. After all, you created the content specifically to address your reader’s needs. You’d think it would be obvious what benefit they will get from reading it. But think about how you search for content. If you’re like me, you do a Google search, and then click into the most promising couple of links to check them out. In that context, the article that tells me exactly what I’m in for is going to win every time. The folks at Social Media Examiner are great at answering this question. In the first paragraph or two of every post, there’s a bolded sentence that says exactly what’s in it for the reader. That’s part of the reason their posts get read and shared like nobody’s business. This question is all about the credibility of the source. Based on the scant information your reader gets in the first 15 seconds, they will decide whether or not to trust you. The easiest way to fail this test is to either omit the author by line, or bury it at the end. If your reader sees no attribution at the top of the article, they may assume it’s a generic piece written by committee, solely to promote a corporation’s products. If someone won’t even take credit for the content, how trustworthy can it be? People want to read work written by humans for humans. Make sure your content has an author’s name, photo, and a link to their bio right up top. #4: How Hard Will This Be to Read? The last question your reader asks before committing is how much of a commitment you’re asking for, and how easy it will be to fulfill that commitment. Now, I realize that not all content is text-based, but the phrase “consume content” give me hives. So we can apply this question to video and content like SlideShare presentations as well. For text, make sure your content is optimized for web readability. Short paragraphs, headers, visual interest. You can write a 1500-word article and people will read it—but you have to make it easy. The same applies to video. A single 50-minute video is a big ask. Five ten-minute videos is smaller. Three 5-minute videos that really get to the heart of things is even better. Once someone watches the first one, they’ll be more compelled to finish the series. I’d say think of SlideShare presentations in the same way. It’s easy to put up the slides from your last webinar and ask readers to click through 192 slides. 192 slides that start, by the way, with greetings to your webinar attendees and instructions on how to ask questions during the webinar. In other words, with completely irrelevant information. It’s possible to get readers to make that commitment. But imagine there’s another SlideShare that starts with a compelling intro aimed at the reader and hits the key points in 20 slides…which one do you think wins? The battle for readers’ attention takes place in 15-second intervals. And that’s a generous assessment. For a rodeo cowboy or a viral internet celebrity (remember Chewbacca Mom? Vaguely? ), that is an eternity. For the rest of us, it’s a daunting deadline. Calling out a specific audience? Written by an actual human? Not a chore to read? The clock is ticking. Make every second count.